Today is Lois’ birthday (Happy Birthday Lois!). We had expected to be in VA all of May. Unfortunately, a few details got in the way and we returned to NY this week and will remain here for the rest of the month. If we were down in Richmond, we’d likely have gotten together with a bunch of people for dinner tonight, but that too will have to wait until later this summer. So, what’s a couple to do to celebrate? We don’t exchange gifts, so I just asked Lois if there was anything she wanted to do. 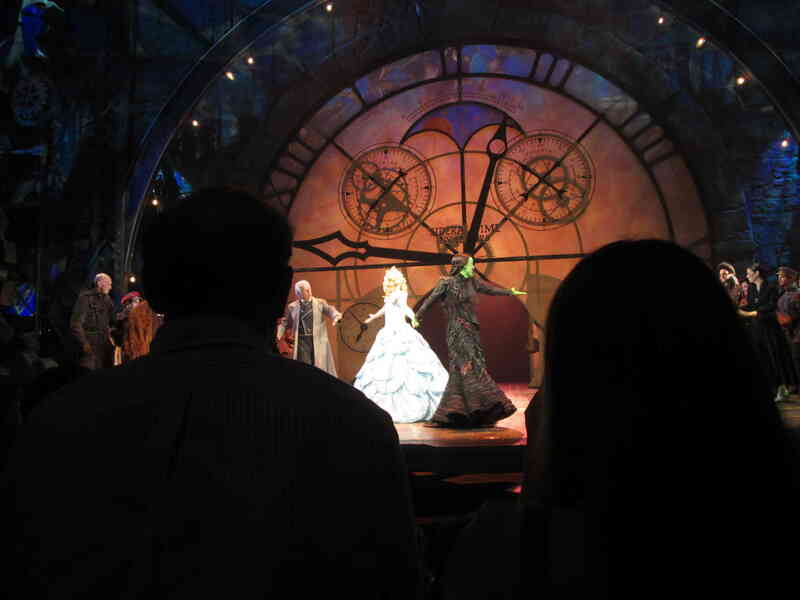 She wondered whether I’d be interested in seeing Wicked again. Given that it’s been 1,207 days since we last saw it (but who’s counting? ), it couldn’t have been a serious question. I immediately grabbed two tickets and we were both very excited to see it again. Here’s a link to that blog. As you can see, we loved it then. One highlight (of many): the final song, For Good, has occasionally been a weak point (for me) even in otherwise terrific shows. It’s a trickier song to nail than it appears, especially to get both witches to perform it perfectly, individually and in harmony. Today: flawless and chill-inducing! I title the first Inviting. 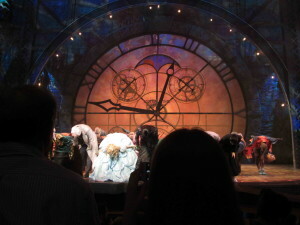 Here you see Caroline/Elphaba and Kara/Glinda inviting the rest of the cast to join them in what was a rousing standing ovation. No matter how successful we are, individually or as a couple (in their case, individually and as a couple of witches), the achievement comes with the help of every single other person on and off the stage. We should never forget to invite everyone who helped us, to join in whatever praise we may earn. Next is titled Bowing. Receiving praise is wonderful, but we should never forget to give the most heartfelt thanks for that praise. Never forget that even if you deserve the praise, people (in this case an audience) don’t have to lend you their attention to begin with, so be grateful for their attention first, and for the opportunity to earn their praise. Finally, Waving. You’ve been praised, you’ve returned thanks, now take one final moment to share in the joy collectively. Lois and I never lose sight of these principles, even on the few days a year that are not either of our birthdays. But, especially on a day like today, we invite everyone who helped create the wonderful life we live to hold our hands. Collectively, we offer our gratitude (via a bow) to everyone who has given us any amount of love. We send out a smile and a wave to those who are still on the journey with us.